News Release #10 – Chigasaki-shi will work with 111-HAWAII PROJECT! 16 Apr News Release #10 – Chigasaki-shi will work with 111-HAWAII PROJECT! and Japanese industry in cooperation with sister city of Honolulu, Chigasaki-shi! 111-HAWAII PROJECT, An officially endorsed “contribution business” project by Hawaii Tourism Japan, cooperated with Chigasaki-shi which established a sister city relationship with Honolulu in 2014, and started PR of 111-HAWAII PROJECT and sales of 111-HAWAII goods in Japan as a part of cultural exchange between Hawaii and Japanese industry. Founded by Clarence Lee Design in January 2015, the 111-HAWAII PROJECT is an officially certified project endorsed by Hawaii Tourism Japan. The purpose of this project is to revitalize local business by developing made in Hawaii goods of Hawaii local businesses via strong unified branding, and a portion of sales will be donated to local Non-profit organizations that help protect the Hawaii environment and culture. A lot of companies, organizations and groups which approved this project take a part in and working together to revitalize the Hawaii local community with the slogan ” Standing together as “1”, we can revitalize Local Business in Hawaii”. 111-HAWAII PROJECT are selling made in Hawaii products and 111-Hawaii PR products designed with character mascots, Diamond Headog or Diamond Headolphin. A portion of all sales will be donated to the Hawaii local No-profit organizations which help protect the Hawaii environment and culture. We will contribute to Hawaii by popularizing the wonderful made-in-Hawaii products in Japan, we are also aiming further vitalization of local communities by exchanging culture and industries between Japan and Hawaii. As one of sister-city activities, Chigasaki-shi take a part in this project as a supporting organization and promote cultural exchange through having relationship with Hawaii industries and made-in-Hawaii products. 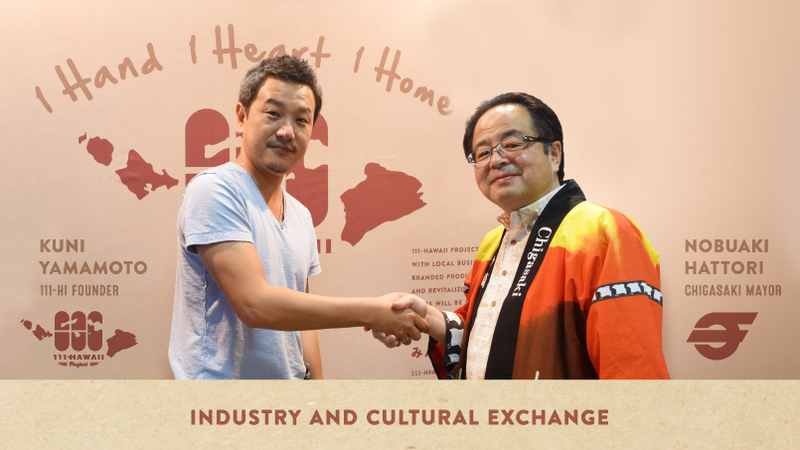 Chigasaki-shi is aiming to realize ” New style cultural exchange” by supporting PR and sales of 111-HAWAII products. 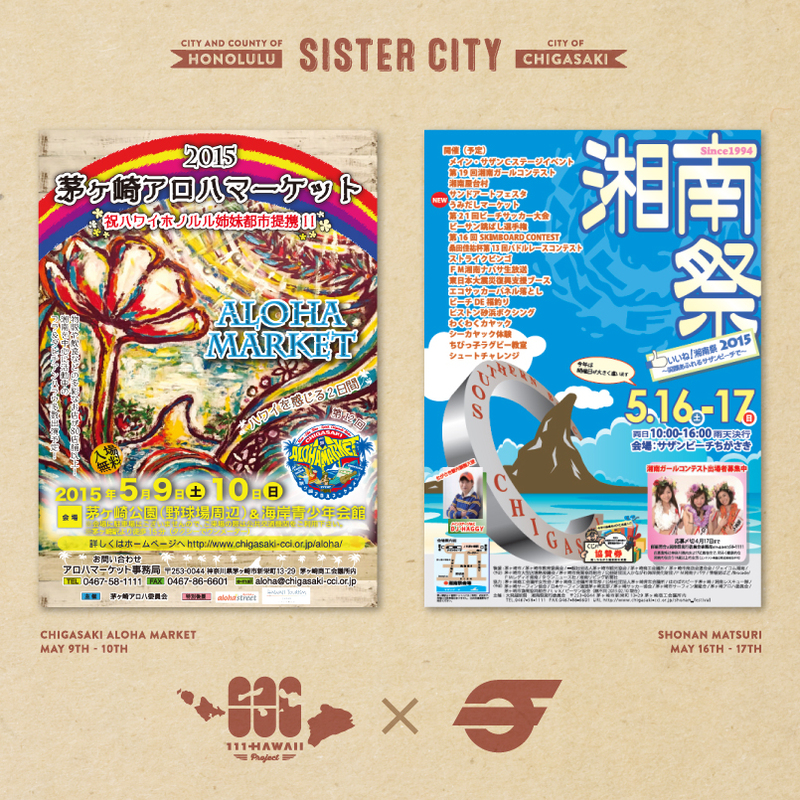 It was decided to perform PR and the product sale of this project in the sister city interchange booth which exhibited for the following two events, Chigasaki Aloha Market 2015 and Shonan Festival 2015 as the first activity. An event where Chigasaki brand and Hawaii related products are introduced. Chigasaki-shi and Honolulu establishing a sister city relationship will bring in Hawaiian culture to the event, such as booths of “Aloha shirts, Hawaiian drinks, foods, goods, and jewelries”, as well as “Hawaiian music, Hula dance, workshops (Hawaiian quilt, ribbon lei, ukulele, Hula)”. Counting its 22nd year, Shonan Festival is an event where you can experience Shonan beach and the feeling of summer. Events such as “Keisuke Kuwata’s paddle race” and “Beach sandal tossing championship”, as well as stage shows like “Live concert, Hula, Shonan girls contest” are held during the festival. At the “Shonan Yataimura”, over 50 booths of goods, foods and drinks are being sold.